Ivy is widespread in France and is native to Western, Central and Southern Europe. Its distribution extends from Southern Scandinavia (Norway and Sweden) in the north to Latvia and the Ukraine in the east and southeast to Bulgaria, Western Turkey, Greece (including Crete) and Cyprus. It is found up to about 515 m above sea level. It is a woody climber with distinct juvenile and mature stages, both with evergreen leaves; the juvenile stage usually has lobed leaves and rooting stems, and the mature stage has rootless, flowering shoots with unlobed leaves. I was always lead to believe when younger, (as were many people), that Ivy “strangled” trees and was a thug to be removed but contrary to popular beliefs Ivy is not a parasite, does not normally damage sound buildings or walls, is rarely a threat to healthy trees and if we look around it shouldn’t take long to find plenty of examples of large old trees supporting Ivy that is of a great age although sometimes small young trees may become overburdened by the weight, especially when weighed down with snow. What many people are unaware of is that it is one of the most important native species there is that is critical in the development and survival of a large number of other important native species in a variety of ways. With an especially high fat content the berries provide one of the most nutritious fruits available to many bird species in winter. The foliage provides cover for birds, (and other creatures, especially insects), from the cold in winter and a dense nesting habitat for a number of different birds. Perhaps the most important function of mature Ivy is when it flowers, generally September / October depending on the region and the weather conditions in any given year. 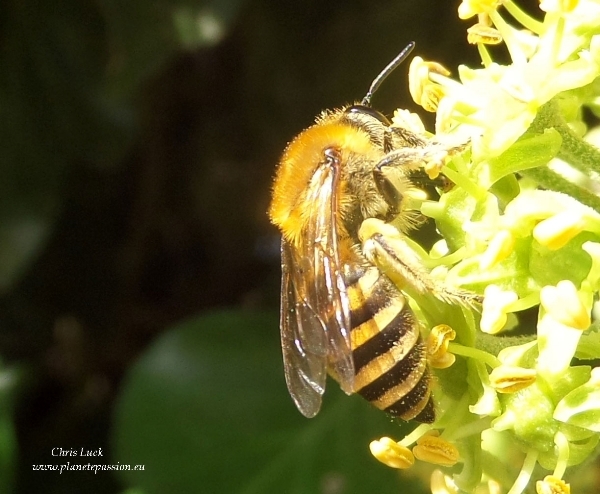 The flowers that are in spherical clusters produce a distinct and powerful scent which provide an important late source of both nectar and pollen to over 70 insect species some with a more or less total dependency on it such as the aptly named Ivy bee. 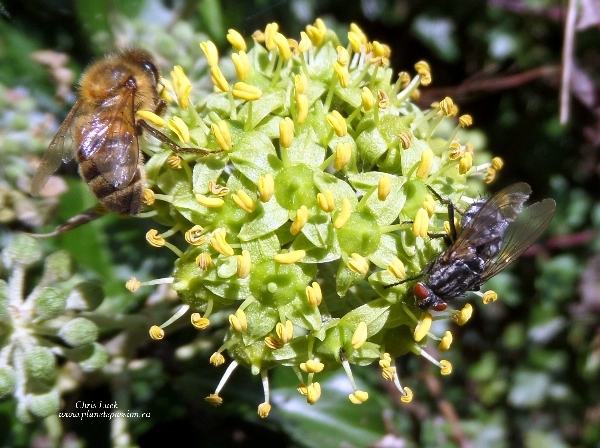 It supplies much need forage for honey bees to top up their stores for winter and also for Queen Wasps, Hornets and Bumble bees to feed on prior to hibernation. 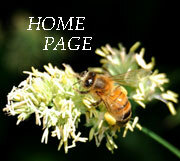 The Butterfly, Moth and Hoverfly species that hibernate for the winter also benefit from the late source of nectar. Brimstone, Peacock, Large and Small Tortoiseshell, Comma and Red Admiral are all well known butterflies that hibernate as adults and the much loved Hummingbird hawk moth is one of many moths that over winter as adults in France. 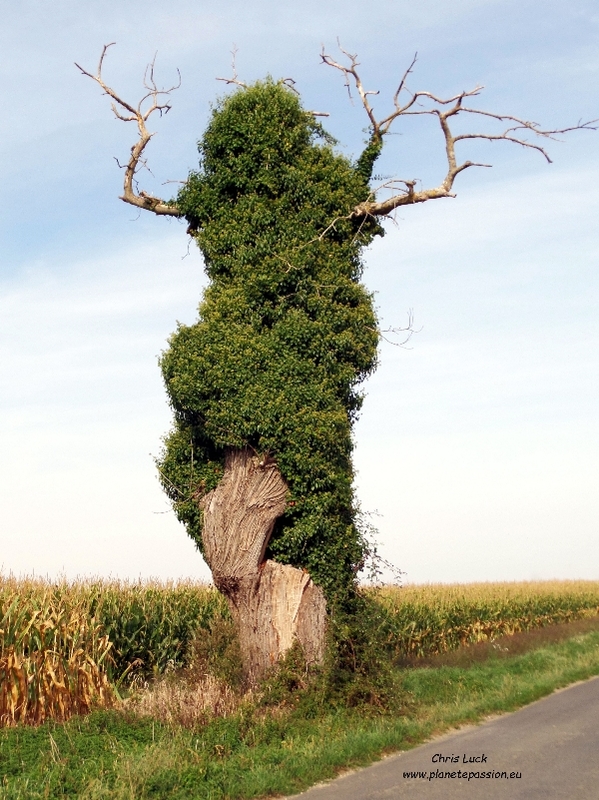 It’s unclear just how long Ivy can live if left on a tree and to some extent it will depend on the life of the tree and obviously if the Ivy is allowed to remain there. 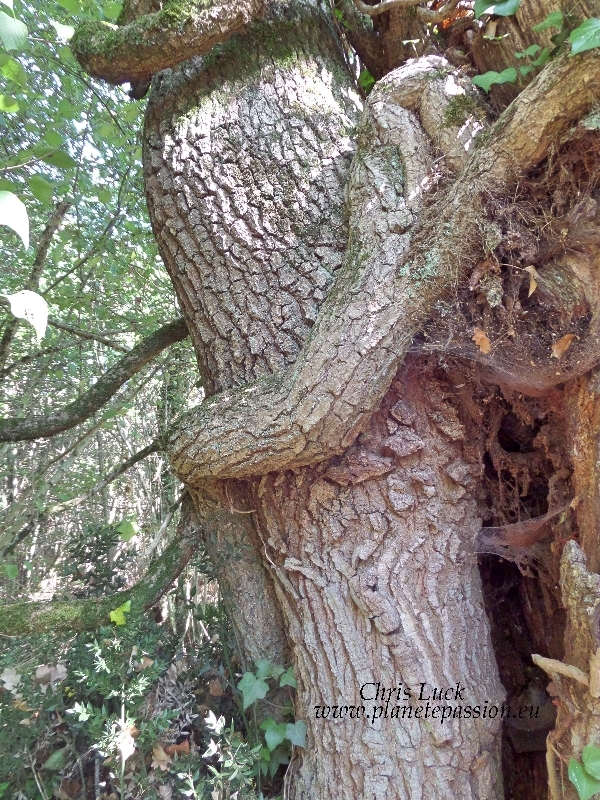 Certainly 50 or 60 years is easily possible and there is a report of a 433-year-old stem of English ivy that was over 20 inches (60 cm) in diameter, but it is unclear where it occurred (cited in The biology of vines. New York: Cambridge University Press: 127-160. ISBN: 9780521392501). 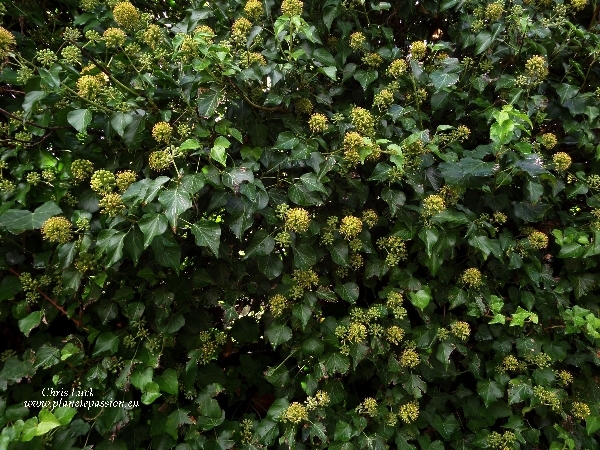 Given the unquestionable importance of mature flowering Ivy we should try to leave it in place and resist any urges to remove it and you will be rewarded in autumn when it buzzes on sunny days with the sound of thousands of bees and insects.